Once you have decided upon your screen format, the next question is what you have put with it. Do you include a poster or poster map, such as Chaosium, Inc.’s last screen for Call of Cthulhu? Or a reference work like the GM Resource Book for Pelgrane Press’ Trail of Cthulhu? Or a scenario such as ‘A Restoration of Evil’ for the Keeper’s Screen for Call of Cthulhu from 2000. In general, In general, the heavier and sturdier the screen, the more likely it is that the screen will be sold unaccompanied, such as those published by Cubicle Seven Entertainment for the Starblazer Adventures: The Rock & Roll Space Opera Adventure Game and Doctor Who: Adventures in Time and Space RPGs. I like my Screen to come with something. Not a poster or poster map, but some form of reference material. Which is why I am fond of both the Sholari Reference Pack for SkyRealms of Jorune and the GM Resource Book for Pelgrane Press’ Trail of Cthulhu. Nevertheless, I also like GM Screens when they come with a scenario, which is one reason why I like Delta Green: Need to Know, the new screen published by Arc Dream Publishing for use with Delta Green: A Role-Playing Game of Lovecraftian Horror and Conspiracy. Further, Delta Green: Need to Know comes with rules enough to create player characters or Agents and the basic rules to play the scenario. In other words, Delta Green: Need to Know is the ‘QuickStart Rules’ for Delta Green: A Role-Playing Game of Lovecraftian Horror and Conspiracy. Now it cannot be stressed how radical Delta Green was when it was first presented in The Unspeakable Oath #7 in 1993 and then in 1997 in the Origins Award for Best Roleplaying Supplement, Delta Green. It updated the presence of the Cthulhu Mythos for the then present, explained how it remained hidden in the then and now, and gave a reason that explained why anyone would investigate it. Essentially it layered the Mythos behind various conspiracies, including that of that of the New World Order and a healthy dollop of UFOlogy, and then folded the investigators into another conspiracy that was investigating the other and its secrets. Published by Pagan Publishing, in the next nineteen years, Delta Green would be supported by more fiction than gaming supplements, an issue with the limits of licensing agreement with Chaosium, Inc., but following a successful Kickstarter campaign, Arc Dream Publishing is presenting the Delta Green setting anew, updating it for the new millenium and the Post-9/11 political landscape. Beginning with Delta Green: Need to Know. The screen with Delta Green: Need to Know is a four panel affair in landscape format. It can roughly be divided into four sections—‘// Using Stats & Dice //’, ‘// Combat //’, ‘// Wounds & Ailments //’, and ‘// Sanity & Willpower //’—that cover most of the actions that an Agent can undertake. The rules are neatly summarised from both the Need to Know booklet and also the Delta Green: Agent's Handbook, which presents the basic background and rules as well as the full means to create investigators or Agents. It is simply arranged and everything is easy to read, but there is one element missing. It does not include page references to either the rules given in Need to Know or Delta Green: Agent's Handbook. It certainly needs them for the latter rather than the former. Nevertheless, the screen is useful for running the scenario in Need to Know, as well as in the long term. Given that Delta Green: Need to Know is the first release for Delta Green: A Role-Playing Game of Lovecraftian Horror and Conspiracy, it should be pointed out that as useful as the screen is, it is the least interesting element to Delta Green: Need to Know. 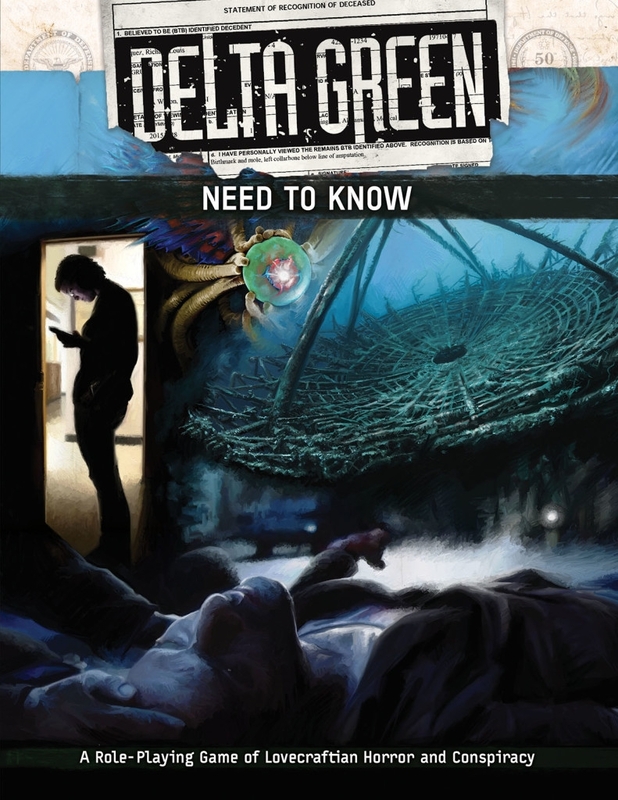 The Need to Know booklet is far more interesting and before getting into the booklet that comes with Delta Green: Need to Know, it is important to note what Delta Green: A Role-Playing Game of Lovecraftian Horror and Conspiracy is and what Delta Green: A Role-Playing Game of Lovecraftian Horror and Conspiracy is not. First and foremost, it is not a Call of Cthulhu roleplaying game, as much as its origins lie in being supplement for that RPG, yet it is also a Call of Cthulhu roleplaying game because it draws from the same sources and the same mechanics. Delta Green: A Role-Playing Game of Lovecraftian Horror and Conspiracy uses the same mechanics as Call of Cthulhu because both draw from the Basic Roleplay System, but there are differences which bring nuances not present in Call of Cthulhu, at least not in editions of the RPG prior to Seventh Edition. Delta Green: A Role-Playing Game of Lovecraftian Horror and Conspiracy uses the same literary sources as Call of Cthulhu—the writings of H.P. Lovecraft and similar authors—but how much and to what extent is not clear in either Delta Green: Need to Know or Delta Green: Agent's Handbook. This will have to wait until the release of Case Officer’s Handbook, the book for the Handler (as the GM is known in Delta Green: A Role-Playing Game of Lovecraftian Horror and Conspiracy). Further, the Cthulhu Mythos is not even present in the game, rather it is named as a knowledge skill called ‘Unnatural’. To anyone familiar with Call of Cthulhu, this may seem odd, even unnatural, but actually changing the name obfuscates and mystifies the Mythos under yet another layer of shadow. Which in many ways is what Delta Green: A Role-Playing Game of Lovecraftian Horror and Conspiracy is about. This is the first of numerous changes that can be best showed cased by presenting an Agent as player characters (or Investigators) are known in Delta Green: A Role-Playing Game of Lovecraftian Horror and Conspiracy. To start with, an Agent looks not dissimilar to an Investigator. The same attributes are used, though SIZ is not used. Every stat has derived value—equal to five times its value—to roll against when using it directly and stats under nine or over twelve also have a distinguishing feature. An Agent also has Bonds—personal connections—that tie him to the natural world that to some extent will bolster his ability to withstand the ‘Unnatural’, but yet will suffer as consequence. In terms of skills there are relatively few changes, most of which to reduce the number of skills to choose from. So Alertness covers perception-based skills like Spot Hidden and Listen, Firearms covers guns, and so on. For obvious reasons, there is Cthulhu Mythos skill, it instead being replaced by the Unnatural skill, which covers all “Things Man Was Not Meant to Know”. In addition to skills, Agents can have special training, such lockpicking, parachuting, or SCUBA diving, each tied to an existing skill, or in some cases, a stat. In Delta Green: Need to Know, Agent creation is designed to be quick and easy. Several different sets of arrays are given for the stats. A player selects one and assigns the points to his Agent’s stats as he likes. (The Delta Green: Agent's Handbook provides more options.) Choice of Profession—there are eight given, ranging from Anthropologist/Historian and Federal Agent to Scientist and Special Operator—grants the base skills and their values, plus some options. (Of the eight Professions, only the Special Operator needs some sort of explanation, and this is that the Special Operator is a soldier, ex-military, military contractor, and so on.) In addition, there are Bonus skill points to be assigned. Besides this a player needs to decide on his Agent’s Employer, Bonds, Motivations, and reason for being co-opted into Delta Green. Most of these are up to the player, but each Profession also determines the number of Bonds an Agent has, essentially the more time consuming the job, the fewer bonds available. As to the reason that brought an Agent to Delta Green, this is a traumatic incident in their past such as Extreme Violence, Imprisonment, Things Man Was Not Meant to Know and so on. Each is mostly traumatically deleterious to an Agent’s stats, though there may be some minor bonuses too. Overall, Agent creation in Delta Green: Need to Know is quick and easy. It also includes six ready to play agents. They include an FBI interrogator, an anthropologist with an interest in the occult, a computer scientist obsessed with puzzles, and so on. They are fully written up and come with fully worked out sheets and backgrounds. Essentially they are included for quick start games, perhaps at a convention, or as examples of what the basic rules in Delta Green: Need to Know can do. Whereas the Agent creation rules are better aimed players with more experience of the setting or looking towards long term play. Mechanically, Delta Green: Need to Know and thus Delta Green: Agent's Handbook, is a percentile system—no surprise given that it is derived from the Basic Roleplay System. Delta Green: Need to Know keeps the mechanics even simpler. Penalties and bonuses rarely amount to more than a flat -20% or +20% and when it comes to a Luck roll, an Agent has just a flat 50%. In Delta Green it is not a derived value. Combat is noticeably deadlier with many weapons having a flat Lethality rating in addition to the damage they ordinarily do. For example, a short burst from a submachine gun has a Lethality rating of 10%, whilst a grenade has a Lethality rating of 15% in a 10 metre radius. Roll under this and an Agent or the target—if human—is dead. Not even Body Armour protects against this, though cover will. As befitting a roleplaying game of Lovecraftian investigative horror, the rules for Sanity in Delta Green: Need to Know—and thus Delta Green: Agent's Handbook—are more complex. An Agent can suffer Sanity loss from both suffering and inflicting violence and from a sense of Helplessness as well as the Unnatural. When an Agent suffers a loss of five points of Sanity in one encounter, Temporary Insanity occurs, simply triggering a ‘flight or fight’ response and lasting only a few minutes. If an Agent loses Sanity enough to fall below his Breaking Point—essentially when the terror or stress has become too much, equal to Sanity minus his POW or Willpower—he can acquire a Disorder which will develop later. The nature of the Disorder is determined by the source of the Sanity loss. So PTSD from Violence, Anxiety Disorder from Helplessness, Depersonalisation Disorder from the Unnatural, and so on. Should an Agent lose Sanity or encounter a traumatic trigger related to his Disorder, an acute episode of it can occur. However, in Delta Green, there are ways of preserving an Agent’s Sanity. Willpower can spent to reduce to Sanity loss, but at the same this reduces the value of an Agent’s Bonds, reflecting the loss of and connection to humanity represented by the Bonds. An Agent adapt to sources of Sanity loss from Violence or Helplessness, but whilst this makes him immune to such losses, he also becomes more inhuman. Willpower is a finite resource, but it can be regained through rest, fulfilling a motivation, and so on. Personal pursuits away from an assignment enable an Agent to strengthen a Bond, undergo therapy and regain Sanity, improve a Stat or skill, and so on. In general, the Sanity rules in Delta Green: Need to Know—and thus Delta Green: Agent's Handbook—reflect the wider effect of Sanity loss. The last eight pages of the Need to Know booklet is taken up by the scenario, ‘Last Things Last’. Penned by Bret Kramer—editor of the forthcoming Masks of Nyarlathotep Companion and The Arkham Gazette and author of the Call of Cthulhu monograph, Machine Tractor Station Kharkov-37—‘Last Things Last’ is a ‘Shotgun Scenario’. These are short scenarios, written for Delta Green and envisioned as “ultra-condensed descriptions of possible adventures, plot-hooks, themes, or subplots”, each one being typically submitted to the annual year-end contest on the Delta Green Mailing List and subsequently saved on The Fairfield Project wiki. ‘Last Things Last’ was submitted to the first contest in 2005 and came joint second. ‘Last Things Last’ throws the Agents into the shallow end of Delta Green assignments with a clean up operation. An ex-Delta Green operative has died and the Agents, that is the player characters, are assigned the task of going in and sweeping up anything that could link him to the organisation. Essentially as active Agents themselves, ‘Last Things Last’ showcases what might happen to them following their deaths. Now given the length of the scenario, the investigative process is fairly short, but dealing with what the investigators find is another matter and the point of the scenario. It is quick, it is dirty and it is great for a one-night one-shot or convention scenario. Physically, Delta Green: Need to Know is well presented in full colour. The photographs and documents used to illustrate the booklet are in turns eerie and creepy, nicely hinting at things rather than being explicit. The writing though is problematic. In places it can at best be described as being very direct in its advice to both player and Handler as to what their roles are in playing and running Delta Green, at worst not a little patronising. Better though, to err on the side of the former than the latter, since Delta Green: Need to Know is the RPG’s quick start rules and getting to the point is their very point. So what is not in Delta Green: Need to Know? Well, no background to the Agents’ relationship with the American government or no real idea about what the Agents are facing with regard to the Unnatural, beyond that they are dealing with incursions of the unknown that threaten mankind. Indeed, the Unnatural barely plays a role in Delta Green: Need to Know. Which means that if you know nothing about Delta Green, then Delta Green: Need to Know is not a good place to start as it does not really present an introduction to the setting. It does though, present a decent introduction to the rules as well as well as a good sample scenario. The only way in which it could be better is if the scenario was a team of Agents’ first ‘Night at the Opera’, rather than one suited for more experienced operatives. Which means that as a physical product, if you know nothing about Delta Green, then Delta Green: Need to Know is not really worth purchasing—it only serves as an introduction to both the setting and the mechanics, and nothing more. As a PDF—and a Pay What You Want PDF at that—then Delta Green: Need to Know is definitely worth $10 given that ‘Last Things Last’ will provide an evening’s or a convention game’s worth of entertainment. If you are already a devotee of Delta Green, then you are probably going to want the physical product itself and will be able to read far more into the material given in Need to Know and ‘Last Things Last’ than someone new to it. And then afterwards, run material of your own devising or already owned, either for Delta Green or Call of Cthulhu.